Holy smoke, all those stacked cords of wood look like the Great Wall of China. A lot of work has been done up to this point. But the ten pieces with red ends (indicating what is important) have become buried beneath other things. It reminds me of when my daughter was born and I made the decision to work part-time in order to spend more time with her. Unfortunately, other people figured I had plenty of free time, so I was constantly barraged with requests to volunteer or help various causes or groups. Before I knew it, the reason I cut my work hours had been buried under a ton of other obligations. Just because we get to the "finished product" doesn't mean our project no longer needs our attention; in fact the opposite it true. The red-handled ax is a reminder of the motivating passion that first started us in this direction. It's time to pick it up and whittle away what is unnecessary, so we can nurture and sustain what's been created. Here it looks like there is another Tree of Life motif, knocked a bit askew. I don't do Kabbalah, but it looks like position 6, Tiphareth, is knocked off center. ToL diagrams show Tiphareth pivotal to the whole structure, connected to all the other positions. Given the meaning of the 10 of Wands, I don't think the artist just coloured in random log faces that "sort of" look like the tree of life. Interesting that the axe handle actually makes an eleventh stave. I kind of wish that the stack of cordwood didn't look so much like a picture of a stack of cordwood, being cut at the bottom in such a way as to slice through logs that are supposed to be round. Unless the bottom of the stack is below the level of the brick terrace. Or unless the designer is trying to indicate something in particular by cutting off the bottom of the stack like that, or unless it is supposed to look like a picture of cordwood. I kind of wish that the stack of cordwood didn't look so much like a picture of a stack of cordwood, being cut at the bottom in such a way as to slice through logs that are supposed to be round. This bothers me too. Yet it must be intentional, along with the apparent gaps between the logs. 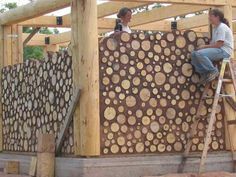 In fact it looks less like a stack of firewood than a cordwood wall. (https://s-media-cache-ak0.pinimg.com...f4b1752b72.jpg) That changes my interpretation of the card a bit. Chopping wood is hard work, and serves a purpose as fuel (in line with viewing staves as the "fire" suit). Certainly, storing a sufficient quantity of wood before the winter is an important accomplishment. But a stack of firewood does nothing by itself: it represents only potential energy until burned. In contrast building a wall is provides a permanent benefit. A completed structure is immediately functional and supplies heat a different way: via insulation and shelter from the elements. This is a long-term achievement, and you will have to live with the consequences of your choices, unless you want to tear the wall down and start over! I see the wood all stacked, this impossible situation is, in the end, possible! The outcome after intense hard work is a strong centered core and the knowledge that if you made it through that forest of firewood, you can make it through the winter.